To me, Kendo is far from a simple sport. It is unrelenting in providing new challenges and opportunities for me to learn and grow from-thus practicing Kendo has provided me with a level of peace and tranquility in my life. Through Kendo, I can look within and improve myself which has led to better interaction with others and a more fulfilling life. Kendo is one of the greater martial arts because it is not based on self-defense but it is geared toward the development of the human character and you can practice it your entire life. You are able to practice with people of all ages and enjoy class when you are in your 70s, 80s and beyond. 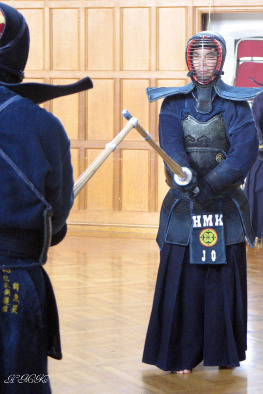 The purpose of kendo is not to harm or win. It is to mold mind and body, cultivate your spirit and share what you have learned with others by penetrating through the gap of your opponent’s spirit. Both the striker and the receiver must be able to exchange smiles after the match. Moreover, Kendo is more fun when enjoying it together. You can share in the joy and pleasure as you teach and learn from each other. Kendo is not an individual sport. You can only experience its true joy when you have a partner. It is a gathering of diverse individuals and a uniting the swords. You can learn from elderly or the young and build integrity through mutual experiences. It is my desire to share kendo with more people. This is the reason why my wife and my two children also enjoy the sport of Kendo. Kendo is a dialog between spirits. And an encounter between passions." Master Francis M. Lee (7th Dan), M.D. My Intangible Possession: "Kumdo for Life"
I once heard that a well-respected Kumdo master asked at his death bed that his wooden sword be placed inside of his tomb. I felt the master's deep love for Kumdo. Also it was a time to reflect on what Kumdo means to me. I crossed a path with Kumdo when I was only a child, and I am now well passed my forties. Kumdo has influenced my life more than I realized, especially as a medical professional. I thank God for this. Sometimes Kumdo is referred to as a path for completing a life's journey. Kumdo is also commonly thought of as a sport of extreme intensity. I am often frustrated by my skill's short-comings, as well my weak inner-strength. This gives me an opportunity to humble myself and motivates me to reach for the next step. These small steps give me an immense inner-satisfaction and pleasure. I understand this process will last my whole life, and I want to call this, my "Kumdo for Life". 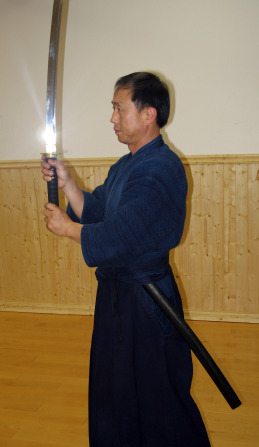 Kumdo (the way-of-sword) does not equate to the technique-of-sword. Skill, power and speed are only elements emphasized by the techniques. The way-of-sword, on the other hand, accentuates: understanding of the how to use a sword, understanding of an opponent's thoughts and the inner-strength to overpower the opponent's will. Learning to use a sword without improving yourself from inside cannot be called Kumdo (the way-of-sword). Winning on a tournament should only a part of the accomplishments a true Kumdoist is measured by. The main goal of a Kumdoist should be to improve oneself from inside. Kumdo provides me a great physical work-out as well. 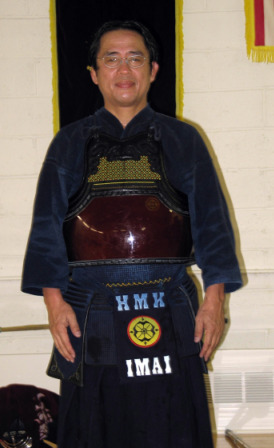 Kumdo helps me sweat off and go all out in a short burst of energy. This has been great for relieving stress from my daily life. It also provides me inner peace and generates a boost of energy. Kumdo also puts my life's problems in perspective and calms me down. Looking back in my life, Kumdo has been my intangible possession. As a child, I have done various kinds of sports. When I became an adult, I was so busy with my work that I couldn't pay attention to sports until I realized that health was the most important foundation. I have realized that you needed to be healthy in order to work and raise a family. When I realized this, instead of picking any kind of sport, I started liking the idea of using a sword. However, after some time, waving a sword had its merits but it started to become tedious. It was then when a friend introduced me to orthodox style of kendo and even in busy times, I trained very hard and I was able to build confidence in my health. A sport that I started in my thirties has become a great part of my life for over twenty years. Through Kendo, I was able to have many match experiences. I’ve had the experience of beating a professional athlete who has been doing the sport since he was little. I believe that if you practice hard, your spirit and mentality can make you win. Kendo requires such mentality. With the mentality I have earned through Kendo, I was able to excel in my social life. Kendo is not just a sport that is good exercise but it energizes your life. Of course, physical health is a thing that naturally comes with hard practice but there isn't anything better than Kendo to relieve your stress and find mental stability. Kendo is fun. If it were not fun, so many people would not enjoy the sport. This type of excitement is not what you would get from games. It is a relief from the tension and the thrill you feel through your fingertips and hear when facing an opponent. Moreover, I am thankful that I can enjoy the sport with my son. 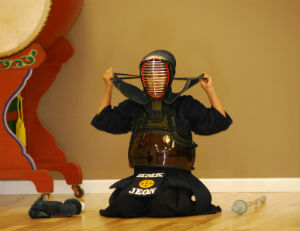 It is so nice to be able to have heart felt conversations with youngsters of my son’s age through Kendo. Kendo is like an old friend. I’ve been doing it for a long time and I can be happy because of it. I regret that I cannot train on a more regular basis due to frequent business trips. However, even after a long day of work, I feel ever so light after a good game of kendo. I am delighted to see my two sons enjoy Kendo as well. It has been a great thing to teach them a martial art that they can enjoy for the rest of their life. From 11 years old I started Tae Kwon Do and branched out into Karate at 17 years old. 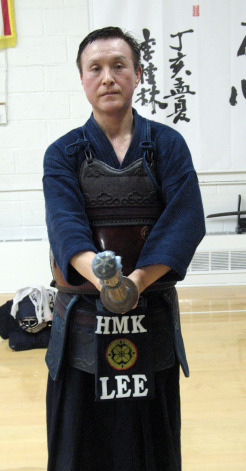 I moved to Hokkaido, Japan after graduation from University in 1995 when I was 21 and started Kendo for the first time. I obtained Shodan in Kendo from Hokkaido and then in 1996 moved to Aichi, Japan where I started Iaido, Eshin Ryu. In 1998 I moved to Saitama, Japan where I started my practice in Iaido, Musoshinden Ryu. I have tested for all ranks through the Saitama Kendo Federation and have obtained 4dan in Kendo in 2009 and 4dan in Iaido 2010. Until my departure from Japan last year, I was an active member in the Atago Police Club Evening Practice (愛宕倶楽部) since 2004 located in Shimbashi, Tokyo. With my work as an international attorney, I have had the great opportunity to practice kendo around the world. I have travelled around Japan and had the opportunity to train at the famous old Noma Dojo in Tokyo (野間道場), Yoseikai in Osaka, Sumiyoshi Shrine in Osaka and various Police Dojos around the country. Overseas in particular, my work took often took me to Melbourne, Australia where I had the opportunity to practice with the Melbourne Budokai, the Melbourne University Kendo Club and the Monash University Kendo Club. I was always willing to pack my bogu for a business trip along with my business suits. In the US I have had the opportunity to practice for an extended time in such locations as Seattle, Los Angeles and Chicago. 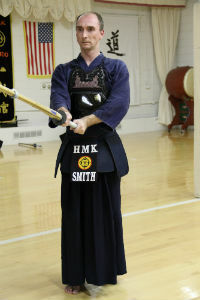 During law school I coached the Southern Illinois University's Kendo Club from 2000-2002. Kendo has always been a great compliment to my life and I am anxious to introduce kendo to my children. I would like to win everyday! Kendo has been an essential part of my life for many reasons. When I was younger I wanted to obtain more discipline and better fitness. I have often noticed that the younger people who practice have much better manners. We must remember Kendo starts with a bow and ends with a bow and those etiquettes are the core of the "Do" in Kendo. As I grew older, I needed Kendo in my for a stress relief, to gain confidence in myself, fitness and for just staying active. People ask me what is the hardest part of playing Kendo. I tell them that the hardest part is simply going to the dojo. This is true because when we get to the dojo we know what to do and it becomes routine but the hardest thing to do is to gain the motivation to go. As long as you have the motivation you will always be successful in Kendo. If you have a bad practice or a good practice you have won the day just by showing up and participating. Kendo is not about winning or being the strongest. It is about growing as an individual. You do not have to be the best or the strongest, just strive to be a little better than what you were yesterday. I have found another aspect to kendo that I did not know before traveling. Kendo is a tool for globalization. If you play kendo and visit another city, state or country you share the same interests as the players with different backgrounds or culture. You are likely to become friends with them as soon as you cross shinai. This is the true joy of Kendo, to practice for yourself, with others and to simply enjoy. I injured my lower back in my twenties. I don't recall the specific cause of my injury, but I figured my sedentary lifestyle coupled with a desk job certainly didn't help. As I received physical therapy, I searched for an activity that will strengthen my lower-back, and someone recommended Kendo. At first, I was a bit skeptical as to how shuffling my feet will help me with my problem, but I was drawn to its mystical beauty. So began my training. Needless to say, Kendo fixed my lower-back and more importantly, it prevented future injuries. Some people found me, a female Kendoka, intimidating due to the preconception / misconception that Kendo is even more difficult to master as a woman. Little do they know that I am first and foremost, a gentle woman. Often my arms would be covered in bruises from the miss-hits from practice. Nevertheless, the bruises constantly reminded me that I was alive as they disappear under my new skin that regenerated over time. 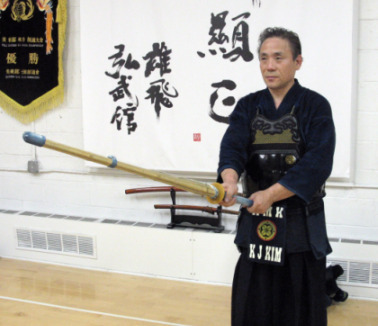 As I practice Kendo, I frequently feel powerless as my mind and my body fail to become one. But I feel proud on the occasions when my mind and body are in sync. These moments prove to me that nothing is impossible with hard work and strong determination. No words can describe the pure joy I feel after a hard session of training. Through the special bond I share with my fellow Kendokas and Masters, I found myself as a member of a very special community based on mutual respect irrespective of age, gender and skills. The fact that I can continue to practice Kendo together with other generations for years to come is certainly an exhilarating thought. After 25 years of training, I finally achieved 5th dan. It took a long time considering I had to split time between Kendo, my two kids, my husband and my work. It was a challenge, but I look forward to many more years of training. Obtaining higher ranks is not my ultimate goal. Instead, I wish to continuously strive for improvement through Kendo.